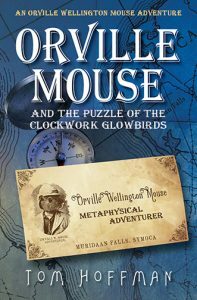 The Bartholomew the Adventurer Trilogy and the Orville Wellington Mouse adventures are multi-leveled stories and have been compared to Chronicles of Narnia, The Hobbit, Neverending Story, etc. The books have underlying themes of ethics, metaphysics, philosophy, quantum physics, and spirituality. A common theme is the idea that there is no magic, only science we don't understand. I am 65 years old and have spent my life studying all these topics. I have a degree in psychology from Georgetown University. The books were written to provide a different way to view the world we live in. To see all life as a single force, all life equally precious, no matter the form. A world where violence is not necessary, a world where the protragonists walk of their own accord into the ferocious fires of life and are changed forever by their difficult choices, by their own sacrifices. A world of empathy, kindness, and love. And of course, ten foot tall ancient robotic rabbits and gigantic carnivorous centipedes living on post apocalyptic planets! Characters are created on an as-needed basis. For instance, in the first book of the Bartholomew the Adventurer Trilogy, Bartholomew is a self-absorbed rabbit searching for a missing object which he cannot name or describe. As it turns out he has a great natural talent for something called 'shaping", or creating physical objects using the power of the mind. The mind is not the physical brain, but is the deeper part of us which exists outside of space and time. On the surface, this would be called magic. I needed a scientist as a counterpart to Bartholomew, so along came Oliver T. Rabbit, Director of Research and Material Acquisitions at the Excelsior Electro-Vacuumator Corporation. Oliver T. Rabbit comes to see the world as a far more complex place than he had originally thought. He also comes to understand the science behind shaping and many other mystical skills. All my characters serve a purpose, they are the archetypes found in all good stories. There are no humans in my books, the world of Bartholomew and Orville is Earth in the distant future, long after humans are gone. Non-human characters like rabbits, mice, rats, robots, and alien forces allow me to discuss a great number of social issues without people taking it personally. It is a way to view human nature objectively. These books are are incredibly fun to write. The characters become a force of their own and I simply watch and listen and record their adventures. A gentle breeze carried the delicate fragrance of ten thousand newly bloomed orange blossoms across the balmy summer air. It was far too early in the season for the trees to be bearing fruit, but the intoxicating scent of the blossoms floating through the grove was more than enough to satisfy Orville Wellington Mouse. Besides, strolling alongside Orville beneath a gloriously radiant summer sun was his best friend in the world, Sophia Mouse, and that alone made him supremely happy. Sophia had moved to Muridaan Falls only one year ago, dropping like a bossy know-it-all gift from above into Orville’s life. He was drawn to her immediately, even though at first blush it would seem the two mice had little or nothing in common. Sophia was always comparing Muridaan Falls to her former home on the planet Quintari. Most of the time Orville didn’t mind, but he liked Muridaan Falls just as it was and sometimes the things Sophia said bothered him just a little bit. Of course he never said anything to her because Sophia was his best friend in the world and the very last thing he wanted to do was hurt her feelings. Besides, when he thought about it there was nothing wrong with being proud of where you came from. Orville and Sophia made their way out of the picturesque orange grove and over to the enormous tree. Sophia plucked one of the leaves from the tree and examined it, then held it out for Orville to inspect. She gazed at Orville for a moment, then grinned and said, “Hey, I bet you can’t do this.” There was a blink of light and a fat juicy orange appeared in her paw. And then, in less than a blink Orville Wellington Mouse was back in his bed listening to his window rattle wildly in the roaring north wind that screamed down from the towering snow-covered peaks surrounding Muridaan Falls.